Live rightly, die, die… explores the contemporary phenomenon of artistic tourism and the exotic through a select number of visual works. However, instead of simply illustrating or documenting the recent trends that might be associated with tourism and the exotic in contemporary art, Live rightly, die, die… attempts to address the phenomena of tourism and the exotic within an eccentric frame of historical reference and in a way that exposes their spatio-temporal ambiguities, tensions and possibilities. It is through these ambiguities and tensions that the question is raised of the possible existences of unknown places, opaque languages, singular encounters, treacherous, unstable spaces and idiosyncratic exchanges. Live Rightly, die, die… by David Tomas is a stand-alone title among Dazibao’s published collections. 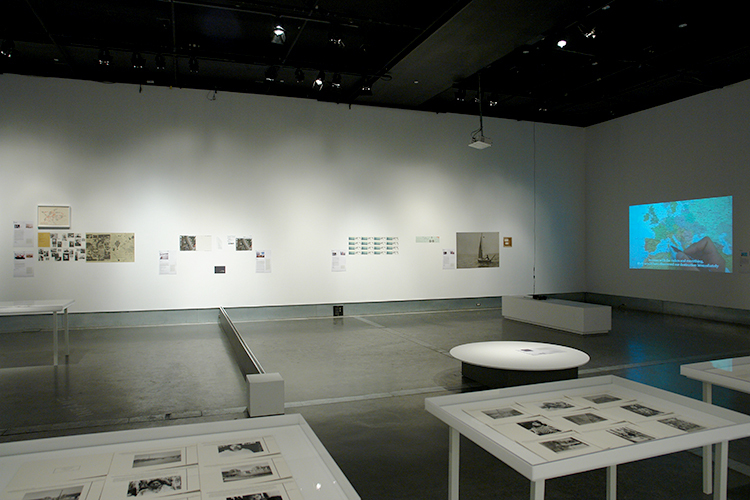 It is structured by the doubled logic of essay, in English and French, and visual journey, that retraces the two part exhibition (Part I, Part II) of the same title held at Dazibao, in residence at the Cinématèque québécoise, from March 1st to April 25th, 2012. These two approaches, textual and visual, offer Tomas distinct solutions to the issues raised by the project’s various components. The result is a singular work, a hybrid essay and artist’s book, where the distinct functions of each genre are deployed, come together, are contaminated. This book looks at works, artefacts and documents by Bas Jan Ader, Francis Alÿs, Lothar Baumgarten, Pavel Braila, Marcel Broodthaers, Stanley Brouwn, Chris Burden, André Cadere, Tim Clark, Willem de Rooij, Guy Debord, Documenta 11, Jan Dibbets, e-flux, Leon Golub, Richard Hamilton, Jamelie Hassan, Allan Kaprow, Bouchra Khalili, John Latham, George Maciunas, Vincent Meessen, NASA, Irving Penn, Robert Smithson, and David Tomas, among others. Over the past 20 years there has been a notable increase in the transnational circulation of cultural information through multiple forms of artistic activity. This activity has emerged in tandem with neoliberal models of global trade and the creation of interlocked systems of economic and cultural exchange. This circulation and its possible relationships with economic and culture patterns of globalization raise fundamental questions about the models upon which these activities are founded and status of the information once it has been presented in new cultural locations. Are artists now engaged in a new professionalized form of artistic tourism and amateur ethnography? And what is the relationship between tourism, information gathering and reception, and the exotic in contemporary art? The works that have been selected for Live rightly, die, die… were initially identified on the basis of their resonance with preliminary, intuitive conceptions of tourism and the exotic. Joseph Conrad’s Heart of Darkness and two photographic documents—an anonymous nineteenth century reproduction of an eighteenth century handbill promoting stagecoach travel between London and York and the earliest known photographic documentation of a Chinese Lingchi execution—served as filters and channels to focus these conceptions and to raise specific questions about the relationships that can exist between media, subject matter, travel and the exotic. Over the past few years, one information portal has demarcated itself in relation to the art world’s information economy. This portal is e-flux. This hub of information transfer and dissemination serves as a primary source of news about what is happening in the art world in terms of exhibitions and publications. Selected e-flux news bulletins have been used in place of traditional captions in Live rightly, die, die… in order to introduce and to explore current forms of information tourism, where the concepts of tourist and the exotic take on a more dematerialized form and where an unknown place, language, singular encounter, unstable space and idiosyncratic exchange can take on a different, if no less treacherous form.